The Arctic Tern has a worldwide, circumpolar breeding distribution which is continuous; there are no recognized subspecies. It can be found in coastal regions in cooler temperate parts of North America and Eurasia during the northern summer. While wintering during the southern summer, it can be found at sea, reaching the southern edge of the Antarctic ice. The Arctic Tern is famous for its migration; it flies from its Arctic breeding grounds to the Antarctic and back again each year. This 12,000 mile journey each way (measured point to point) ensures that this bird sees two summers per year and more daylight than any other creature on the planet. One example of this bird's remarkable long-distance flying abilities involves an Arctic Tern ringed as an unfledged chick on the Farne Islands, Northumberland, UK, in the northern summer of 1982, which reached Melbourne, Australia, in October 1982, a sea journey of over 14,000 miles in just three months from fledging. Another example is that of a chick ringed in Labrador, Canada, on 23 July 1928. It was found in South Africa four months later. The average Arctic Tern lives about twenty years, and will travel about 1.5 million miles. 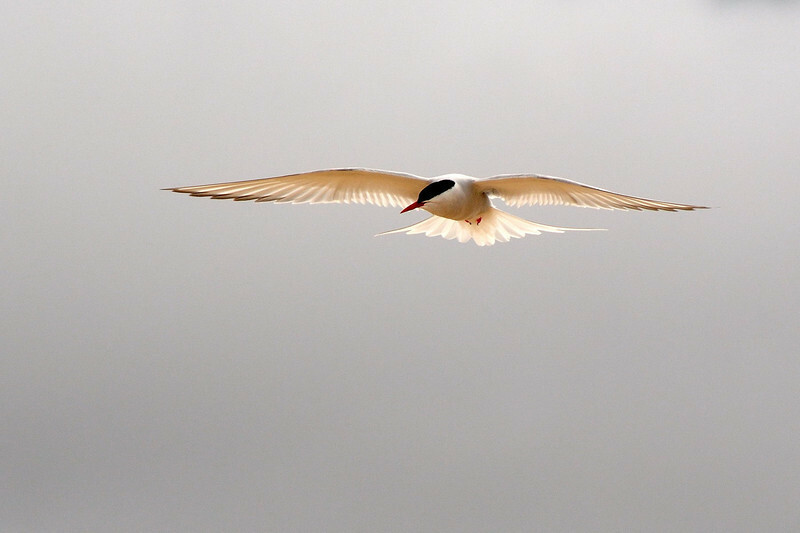 Arctic Terns usually migrate far offshore; consequently, they are rarely seen from land outside the breeding season. (Thanks are due to Wikipedia for the above details).